– Where and who are our tax dollars going to? – What are those tax dollars being used for? – Are their different tax rates for different advertisers? – Can we exploit any loopholes? – Are our tax dollars benefiting us or is it just a waste? Whichever part of the spectrum of opinion you fall in regarding taxation in general, what can be agreed upon is that in a free society, taxes are supposed to be used for the greater public good that ultimately benefits us all individually and society as a whole. Of course if you are a signed up member of the Libertarian or Tea Party versus being a member of a left leaning party in a Scandinavian country, your view on the level of taxation and the scope of what it should cover will probably differ completely. So this ultimately brings us to Display media and the growing chorus of voices bemoaning that for every dollar of Display media of purchased by an advertiser, up to an additional 35% (i.e. the tax) is levied in additional costs. And whether this tax is actually benefiting anybody or is it just additional greedy players looking for their own cut of this growing Display advertising pie. Where and who are our tax dollars going to? 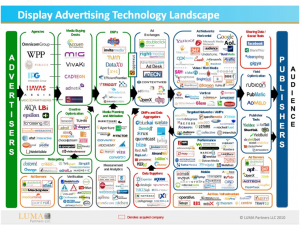 The famous Terence Kawaja Display eco-system chart best illustrates who all these players are that exist between the Advertiser, (i.e. Coca Cola) and the Publisher, (i.e. Bloomberg). So the premium on top of the raw Display media cost Advertisers are paying is going to these players of which Efficient Frontier is a member. What are those tax dollars being used for? All of these types players provide a service as described usually for either a management fee or some form of arbitrage of the buy and sell cost of the Display media. Are their different tax rates for different advertisers? The short answer to this question is yes as depending on the sophistication of technology platforms that are used to buy media as well as negotiated rates with entities like Agencies, Ad Networks, etc., the overall premium an advertiser may pay will differ. Of course it not mandatory for an advertiser to use any of the these players, however usually for sophistication, expertise and scale reasons, a large advertiser will almost always employ at least some 3rd party help. Can we exploit any loopholes? This is an interesting question as depending on who you talk to when you discuss the nature of “loopholes” as it relates to a tax code, some view it is at a perfectly legitimate activity where as others view it as anything from a violation of the spirit of the law to outright exploitation. There are certainly inefficiencies in the Display eco-system but with things like Real Time Bidding in recent time, where each impression is now bid on by advertisers based on their respective ROI criteria and valuation of that individual publisher and audience browser. If you look at Figure 2 and focus on the two ad slots on the right side (i.e. 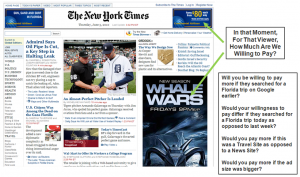 Continental Ad and Whale Wars Ad), we can illustrate the concept of exploiting a “loophole”. Assuming you had two technology platforms as follow, who for arguments sake had similar algorithmic capabilities as it relates to valuing media. Platform (a) would be able to value the ad slots based on the ad size, previous impressions served to that browser, previous ad clicks, nature of the publisher, placement on the page, etc. Platform (b) would be able to do the above but also account for prior search history (and timing of the search queries) of the browser. Therefore, Platform (b) would actually be making a better valuation of the Display media for the advertiser as it has more information feeding the willingness to pay a given rate. If you compared the overall ROI benefit of your marketing spend, this would definitely be a “loophole” worth taking advantage of. Are our tax dollars benefiting us or is it just a waste? Imagine we went back to a world where it was just advertisers and publishers (i.e. Coca Cola & Bloomberg.com) negotiating directly via media buying and sales teams. This would obviously have to be done in advance of a Display media purchase and historically was done for long periods of times (1, 3, 6, 12 months). It is very evident from just these points that the price paid is not going to be a true optimal price for the Advertiser. The advertiser is also negotiating in a silo and has no clear idea what the minimum price level they could pay would be relative to other advertiser’s willingness to pay for the same Display media. Of course depending on the premium you are paying your agency, technology platform, creative partners, ad server, and/or data providers, etc., as well as how good those partners may be, also plays a part in whether the “tax” is worth it. Given the billions of dollars have been invested to create many of the sophisticated platforms and technologies that exist as well as the individual experts within many of these companies, it would seem at face value to be very difficult for advertisers and publishers to both replicate and keep up to date with the advanced buying and selling of media dynamic. That said, ultimately the premium paid on media has to be thoroughly outweighed by the ROI and business benefit to the advertiser and publisher. However as we said there exists some clear distinctions between many of the various players that can be employed to optimize Display media and these are the “loopholes” you can exploit, so the “tax” dollars you spend are very much to your benefit and not a waste!